Our wonderful volunteer choir are back in action! 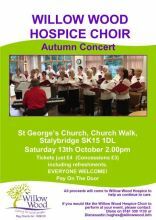 St George's Church in Stalybridge sees our fantastic volunteer choir back in fine voice. They'll be singing a selection of well-loved songs and invite you to attend. Tickets are available on the door and the price of just £4 (£3 concessions) includes refreshments. What good value! If you are holding an event and would like the Willow Wood Hospice Choir to perform, please contact Diane either by ringing 0161 330 1133 or email dianeaustin.hughes@willowwood.info.